Since the founding fathers of Cable & Wireless connected Portcurno in Cornwall to Bombay in India in the 1860’s, the business has been at the heart of nations prosperity and telecommunications infrastructure. In recent year’s Cable & Wireless Communications (CWC) has been through a significant restructure and transformation and now has a strategy which is focused on being the leading Pan-American full service telecoms business. They aim to build on their number 1 position in the 12 of the 15 markets they operate. 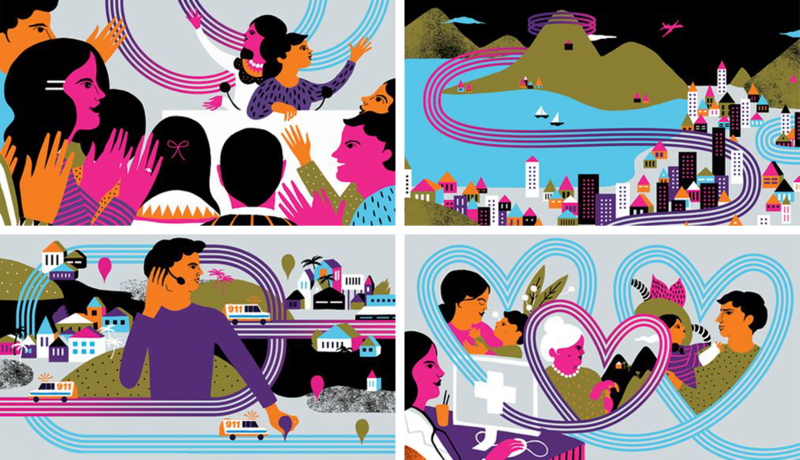 To support the change from a wider global strategy to one which is regionally focused, the team at CWC asked The Allotment to evolve their current brand language and develop a set of stories which would bring to life the real benefit of CWC to the communities they serve in the Panama and the Caribbean. These stories, which on the surface seem ordinary in more developed countries, have had a profound impact on the safety, health and security of the countries where CWC operates. They range from the development of an efficient 911 emergency service throughout Panama, the implementation of an internet service connecting 107 St Vincent and Grenadine's schools to the wonders of the world wide web, to the creation of a new, digital information system for Panama's health infrastructure. To illustrate these compelling stories The Allotment commissioned an illustrator who could capture the colourful and simple visual language of Panama and the Caribbean. The charming works of art by Karolin Schnoor, capture the charm of the region and tell CWC's stories whilst retaining a link to the current brand language. The stories and illustrations (a few examples shown) will be used on the CWC.com website and for other corporate communications.